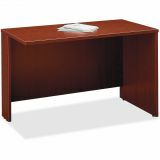 Attaches to 72"W Bow Front Desk Shell, 72"W or 66"W Desk Shell or Credenza on left or right. Return bridge with PVC edge banding works in right- or left-handed configurations. 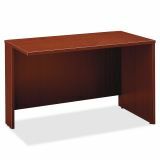 Bush Business Furniture Series C: Mahogany 48W Return Bridge - Bush Business Furniture Series C Collection 48W Return Bridge in Mahogany creates flexible desk space with classic styling and clean line. 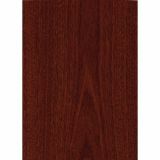 Constructed with 100% thermally fused laminate for durability and superior resistance to scratches and stains. The Bush Business Furniture Series C 48W Return Bridge connects two work surfaces for an L or U-configuration. 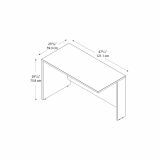 It can attach to a 72W Bow Front Desk Shell, 72W or 66W Desk Shell or Credenza on left or right This unit cannot be used alone. Create affordable elegance within a functional design. Solid construction meets ANSI/BIFMA test standards in place at time of manufacture. The Series C Collection is backed by the Bush Business Furniture 10-Year Warranty. American made with U.S. and imported parts.